Radar detectors work great for a radar that is constantly transmitting, less effective for a radar using instant-on mode, and unreliable for laser radar (lidar). Sometimes police transmit constantly, sometimes police only transmit (Instant-on mode) when targeting a vehicle. Detectors work well for constantly transmitting radars, but can leave little time (fractions to several seconds) to react to Instant-on transmissions. A detector will pickup an Instant-on radar targeting a distance vehicle well in front of the detector, but detections are short, seconds, and sporadic if at all. A good detector can pickup a transmitting radar several miles away in an open environment. Some photo radars are fixed, some are mobile (but operate from a stationary position). All fixed and some mobile photo radars are unattended and transmit constantly. Mobile radars with an operator only transmit when a vehicle is close to the beam (less than 150 feet from the radar). Photo radar angles the beam across-the-road, instead of down-the-road. A detector might pickup a constantly transmitting across-the-road (photo radar or safety radar sign) at about a quarter mile range, but it could be much less. Note: not all speed camera systems use radar. Some systems use road sensors, some use 2 or more license plate recognition cameras. Detectors will not recognize these systems, unless the detector has a GPS and database of speed camera (some databases include red light camera) locations. All detectors are subject to false alerts, but some detectors are better than others at recognizing non-radar signals for fewer false alerts. There are numerous transmitters in the X and K bands that can cause a radar detector alert. A lidar beam is only 0.2° wide, or about 1 foot in diameter at 100 yards. For comparison, a radar beam that is 12° wide, has a 75 feet diameter spread (fan out) at 100 yards. Police are trained to aim a lidar beam at the most reflective parts of a vehicle such as license plate, front grill, lights, or bumper. In most cases a lidar beam will not hit a detector, making lidar detection highly unreliable. All lidar's are Instant-on only, making detection even more unreliable, and leaving little if any reaction time. relatively reliable for constantly transmitting radar. much shorter detection range for photo radar. less effective for instant on radar. Radar detectors are 2 devices built into one, a microwave receiver and a laser sensor. Detector's use an antenna to capture radar signals, and a separate optical aperture for laser signals. A good detector can give a mile or two warning under ideal conditions when a radar is continuously transmitting. Bends in the road or objects that mask the signal will reduce detector performance as well as radar performance. Radar detectors require at least 150 milliseconds, 0.15 seconds, to detect and identify a radar signal. All detectors indicate when a radar or lidar has been detected. Most detectors have a radar signal strength indicator and audio warning beeps, faster beeps for stronger signals. When a lidar is detected an indicator lights up and sounds an audio tone, click, beep, or message, but no signal strength indication. 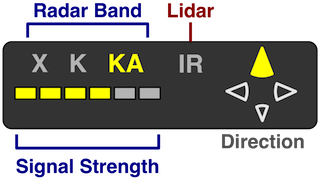 Many detectors indicate the radar band, X, K, or Ka. Some detectors combine X and K band detections into a single indicator (X/K) - an X or a K band radar has been detected. Some detectors combine K and Ka band detections into a single indicator (K/Ka) - a K or a Ka-band radar has been detected. All detectors have front coverage, some also have rear detection, and some also have side detection (360°). Front coverage has better detection than rear coverage, and rear coverage has better detection than side coverage. A few radars with 360° coverage have direction indicators, (front, rear, left, right). Some middle eastern countries and some European countries use Ku band radars that transmit at 13.50 GHz. Some European countries use X band radars at 9.41 GHz or 9.90 GHz. (1) - Indiana, North Carolina, New Jersey and Ohio still use X-band radar in some places. A few radar models by one manufacturer have a POP mode that cannot be picked-up by most detectors. The radar transmits a short 0.067 second pulse, too short for many radar detectors to pickup. The pulse is also too short for the radar to get a reliable measurement, only a speed estimate. The officer must switch to normal mode to get a real speed reading, according to the manufacturer. Some detectors can pickup the mode by incorporating additional processing. In POP mode the radar transmitter is still warming up, making speed measurements outright wrong and random, and subject to mis-interpretation . The mode is used as a selling point, but is not approved by the International Association of Chiefs of Police (IACP). Only one manufacturer is unscrupulous enough to have some models with a POP mode. A very few places and vehicles broadcast safety signals that some radar detectors can receive. A safety signal alerts drivers of a hazard in the area and might be found in construction zones, highways, and emergency or oversized vehicles. There are not enough safety transmitters for this to be a major consideration, if a consideration at all. A number of high performance radar detectors don't waste processing time looking for or decoding these signals. There are 2 types of safety and warning message broadcast systems. Both systems transmit in the police radar K band. Radar detectors not designed to detect the safety message interpret the signal as a K band radar. Some detectors detect a safety message warning signal, but not the message. The SWS transmission has around 60 messages, the Safety Alert has 3 messages. Radar detectors with SWS decoders have been available since 1996. SWS receivers look for a safety warning signal message every 3 to 6 seconds. Sixty-four short fixed text messages are possible, up to 2 different messages may be broadcast one after the other. Variable messages are allowed if none of the available fixed text messages is appropriate. Messages can be broadcast from fixed positions to broadcast travel, weather, train approaching a crossing, construction information, or mobile vehicles including emergency vehicles, school buses, oversized vehicles. Some stationary transmitters can be programmed from a remote location by radio or phone link. Transmit frequencies (K band) include: 24.07, 24.11, and 24.19 GHz. A Radar Detector Detector, also called RDD, looks for radar detector signal leakage. See RDD's section. Many radar detectors can detect an emergency vehicle's strobe light. Some emergency vehicles use a strobe light when the emergency lights are activated. The strobe changes (is suppose to) traffic lights (with strobe detectors) to green. Sometimes it works, and sometimes is doesn't. In most situations a strobe will not illuminate a detector's optical aperture, and not trigger an alert. There is a large selection of traffic radar detectors with a variety of options and prices. Some features and options are listed below, not all detectors have all capabilities. City / Highway mode City mode -- less sensitive (reduced false alerts). Highway mode -- maximum sensitivity. Band Disable Disable X, K, and/or Ka band reception. Driver Alert Beeps periodically to keep driver alert and awake. GPS - you set false alert areas / speed traps, etc. - used with Red Light Camera database. - used with Speed Camera database. - Auto Mute when speed below adjustable level. Misc. - Compass: magnetic north. - Altimeter: atlitude above sea level. - Weather Radio: NOAA from VHF broadcast. Some radar detectors have a built-in GPS and a red light / speed camera database of fixed (permanent) locations. The GPS portion of the detector will alert a driver when approaching a location in the database. The database should be updated regularly, as red light and speed camera locations come and go. Many dedicated GPS's (no radar detection capabilities) can be loaded with a speed and red light camera database to alert drivers when approaching a ticket camera. The database will not contain mobile photo radars. These radars are mounted in vans or cars, or on a trailer, or come in a tripod configuration, and can be easily moved and setup. However, a detector's microwave receiver should pickup photo radar. can disable one or more radar bands. can be programmed for Ku and other frequencies. auto shutdown when and while RDD detected. does not decode safety message. Some detectors mount to the front windshield with suction cups, some attach to a sun visor. The detector should have a clear field-of-view to the road. Keep the detector clear of wiper blades, toll / bridge transponders, window stickers, and other objects. Some windshields have tinting, some only have edge tinting, that can interfere with detector reception. Detectors with rear and/or side coverage should have a clear view of the rear and/or side. On some vehicles the side and rear windows are tinted with a metallic film that can reduce detector reception. To get the best radar reception the detector should be mounted as high as possible. To get (higher chance to get) the best lidar reception the detector should be mounted low. The chances of getting a lidar signal is remote, additionally if the detector has rear and/or side coverage a higher mount is preferable. Some states limit what can and cannot be placed and/or used on windshields, such as suction cups. Alternatives include sun visor or dashboard mounting. The Federal Communication Commission (FCC) does not regulate radar detector use. The FCC does regulate detector emissions that manufacturer's must meet or exceed ((FCC DA 96-2040). Radar detectors are legal in the US except in Virginia, Washington DC, and on military installations. Also, the U.S. Federal Motor Carrier Safety Administration Regulation 392.71 prohibits use or possession of a radar detector in commercial motor vehicles and vehicles over 10,000 pounds. Radar detectors are also illegal in some provinces in Canada and some states in Australia.